Ruby Sipper Clear Dish Hummingbird Feeder - Tray Feeder. 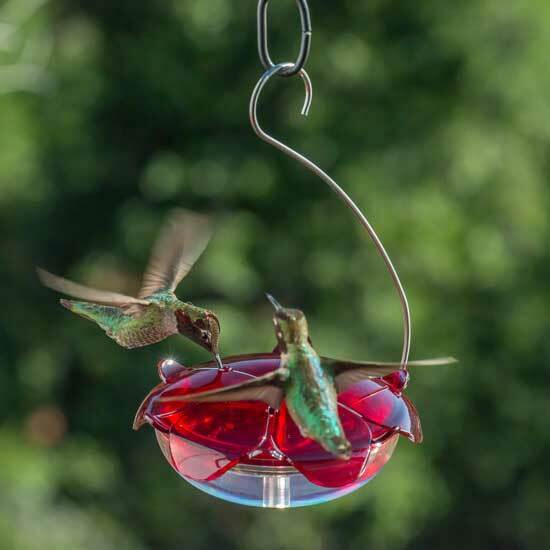 The Ruby Sipper Clear Dish Hummingbird Feeder is one of Droll Yankees' latest line of feeders. This tray type feeder is very attractive and has a 5 ounce capacity which is a great size for displaying multiple feeders in a "Feeding Zone" for our territorial friends. We establish several "Feeding Zones" on our property and hang multiple feeders in each zone. These feeders are a great choice if you would like to establish your own zones. The more feeders available for our friends; the more hummers you will have to enjoy! This is the only feeder that I know of which comes with it's own port cleaning brush! A perfect pairing of whimsical fun and practical performance, all in one stylish saucer feeder. Hangs on a graceful stainless steel wire. Eye-catching ruby red attracts hummingbirds instantly. Clear dish keeps the nectar level visible. The 5 oz. capacity makes it an ideal feeder for establishing multiple feeding zones for territorial hummingbirds. Perfect Little Brush included to keep feeder ports clean.